In today’s post, I want to provide a review of Herculist. As a quick disclaimer upfront, I am a happy customer and affiliate with Herculist.com. I’m going to write about my own experience using their services, and talk about why I recommend using them. Herculist is a safe-list. It is an online database of people who give other members in the database permission to email them with different offers. Herculist.com is an all-inclusive website to advertise your online business and grow your email list. It is also an affiliate program that pays up to 50% of all sales, depending on your membership level. Believe it or not, I learned about Herculist from doing a YouTube search. I was looking for additional solo ad providers and found a video about Herculist. I watched the video and then did my own due diligence and decided to try them out. According to their website, John Gloeckner is the owner. He lives in Iowa. When I researched the domain, it was launched in 2001. I don’t know if they have been owned by the same person the entire time, but I do know they are an established business, more than 10 years old. These are other services, in addition to the email you are allowed to send out free of charge daily. These additional services are 100% optional. You can pay for some of their services, and you can also earn “credits” by reading emails that other members send out. These credits can be redeemed for different advertisements, to promote your own offer. They currently offer three different membership options with Herculist. Free: As a FREE member you can post your advertisement to 1,000 random members daily. You can also earn up to 25% commission on anyone you personally refer. Pro: As a PRO member, you can send your advertisement to 80,000 members (approximate) every 48-hours. The normal cost is $49.95 per year, but right now you can purchase it for just $24.98. There is also a monthly option to pay $9.95 per month, if you just want to try it out before you commit to an annual membership. At this level, you earn a 35% commission on anyone you personally refer. Gold: This is the option I chose. I thought it was the best bang for the buck. The cost for joining as a GOLD member is $89.95 per year, but it is currently being offered at a discounted price of just $44.98 per year. There is also an option to pay $14.95 per month, if you want a monthly payment option instead. 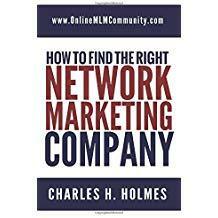 At this level, you can send your advertisement to 80,000 members (approximate) every 24-hours. In addition, you earn a 50% commission on anyone you personally refer. The major benefits of Herculist are that you can generate new leads for your network marketing or affiliate marketing business, each and every single day. It is an all-in-one advertising solution. As a Gold Member, you can send an email to approximately 80,000 people per day. There are also low-cost advertising options such as banner ads, sponsored ads, and solo ads. There’s also an amazing affiliate program, so by referring a few people yourself, you can make enough money to cover the cost of ALL of your own advertising. I also believe this is a great additional income stream for network marketers and internet marketers. After all, just about everyone in our industry struggles to get leads. Now, you can show them an affordable way to do that, and profit from it at the same time. The major downside of being a free member is that you will get a TON of emails every day from other members. I would suggest you open up a separate email account for this, or upgrade to a PRO or GOLD member, so you can set your email to “vacation” mode and not get any emails from other members. 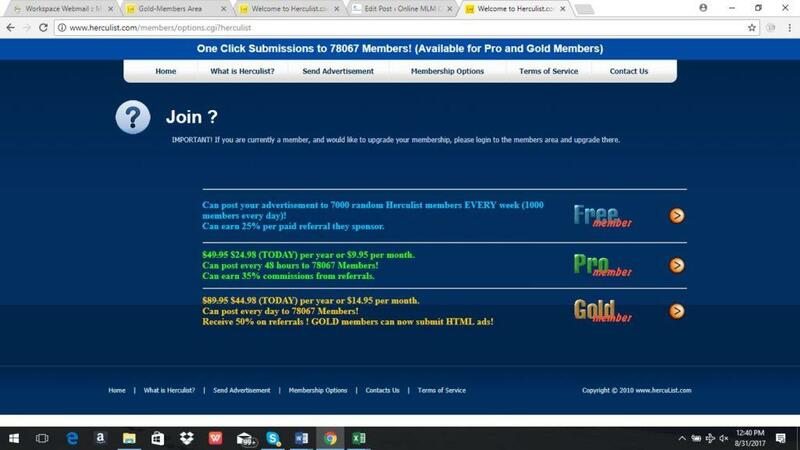 Herculist offers an AWESOME solo ad affiliate program. Anytime anyone you referred to Herculist orders a solo ad, you earn a commission from it. That means if someone you referred buys 10 solo ads per month, you would earn 10 commissions. You can earn up to 50% per solo ad, depending on your membership level, so this can be very lucrative. 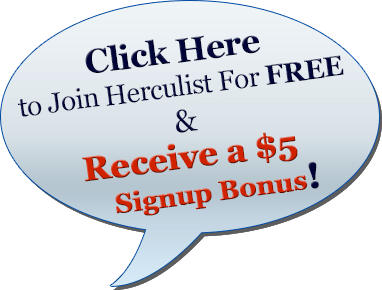 The Herculist affiliate program is free to join, although I do recommend upgrading to a Pro or Gold Membership level, so you can maximize commissions. The payouts are 25% for FREE members, 35% for PRO members, and 50% for GOLD members. Once you hit the $10 threshold, you can get paid. If you make enough sales, you can also get paid daily via Paypal, or check. My experience with Herculist.com has been wonderful. I use it to promote different affiliate programs and capture pages. I also recommend it to just about everyone I talk to, because I know it will help them get more leads for their business. When I was a FREE member, I did get a ton of emails, but after upgrading, I didn’t. To be honest with you, I don’t know where else you can go online, for less than $50 per YEAR, and get the same resources being offered by Herculist. The bottom line is that I am a very happy customer, and I would use their service even if I wasn’t an affiliate. The best way to maximize your membership account is to promote your capture pages. Do not send people to a sales page first. Next, upgrade your account to a Gold membership and send out one email per day to the entire list. Experiment with different ads and capture pages to see what converts best. Make sure you use tracking codes for each ad, so you can test your results. In addition, promote the affiliate program so you can earn some extra money and cover all of your own advertising costs. That would let you advertise your business for free, on complete auto-pilot. Today is August 213, 2018. I just wanted to update this blog post and share my one-year update with Herculist.com. My first year with Herculist.com, I earned approximately $1,600 in commissions (individual results will vary). I also generated over 1,500 leads to different programs I promote. That averages to about 4 leads per day, per email blast. It doesn’t sound like much, but if you take the cost I paid ($49.95) and divided it by 1,500 leads, my cost per lead is less than four cents each. I do not have any other traffic source online that gives me leads so inexpensively. In review, Herculist.com is a great advertising option for anyone trying to build their business online. There is really nothing to lose, since you can join for free and try it out. I’m happy with their services and I am pretty sure you will be too. On a side note, what are your thoughts? Have you tried Herculist.com before? If so, leave a comment below to tell us what your experience was like. I look forward to hearing from you. Hi Chuck, are you still using Herculist? It is a great result if you got on average 4 leads per mailing as a Gold member. I am wondering, how many visits per mailing to 80,000 you got on average? Normally 50 to 100, on average, depending on my offer. The best things to promote on Herculist are systems and traffic sources. Just my thoughts. And yes, I still use Herculist daily and love it.